Seasonal Occurrence: Common spring through fall. Uncommon in winter. Breeds in our area. Notes: The Reddish Egret is a medium to large heron that occurs in two color morphs: dark (reddish-brown) and a much more scarce white morph. The dark morph is bluish gray overall with a rusty neck and head, blue-gray legs and a black bill. 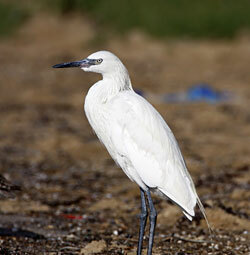 The white morph has all white plumage, blue-gray legs and a black bill. In breeding plumage the base of the bill becomes pink in both morphs. 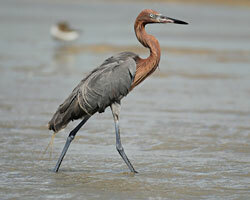 The foraging behavior of the Reddish Egret is distinctive and entertaining. The bird is often seen running, jumping, flapping and spinning in its pursuit of fish. Some liken the active foraging to a dance as the bird dashes about and fans its wings. Reddish Egrets are more tied to salt water than any of the other herons and egrets; they most likely to be found in coastal saltwater marshes. The best sites to observe Reddish Egrets are the Bolivar Flats Shorebirds Sanctuary, Sea Rim State Park, and Brazoria National Wildlife Refuge.